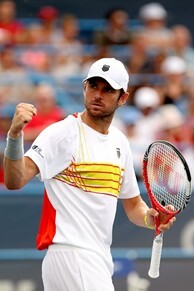 Mardy Fish celebrates match point against Xavier Malisse. WASHINGTON (AP) -- Mardy Fish and Tommy Haas will meet in the Citi Open semifinals Saturday, their first matchup since 2007. They have still seen plenty of each other. After beating Xavier Malisse 6-3, 6-4 on Friday, the top-seeded Fish said he and Haas are "good friends'' who live near each other in Los Angeles, often hanging out and practicing together. The fourth-seeded Haas routed Tobias Kamke 6-1, 6-2. Haas is 3-1 against Fish. "He seems to be pretty close to back to 100 percent with his health and hitting the ball as well as I've seen him hit it in a long time,'' Fish said. Fish reached the semifinals in the tournament for the first time in seven tries. Haas, also making his seventh appearance in the event, reached the semifinals in 2008, too. Second-seeded Alexandr Dolgopolov will face No. 8 Sam Querrey in the other semifinal. Querrey, the winner last week in Los Angeles, beat No. 3 Kevin Anderson 6-4, 6-4, and Dolgopolov topped James Blake 7-6 (3), 6-4. Top-seeded Anastasia Pavlyuchenkova advanced to the women's final with a 4-6, 7-5, 6-4 victory over No. 4 Vania King. Pavlyuchenkova will face Magdalena Rybarikova, a 6-3, 6-3 winner over third-seeded Sloane Stephens. Pavlyuchenkova received treatment for a heat-related illness on the humid, 94-degree day.